Did you just arrive in Japan? Oh dear. Bad timing. I’m sure you’ll have fun, but there are better times to visit. Why, you might ask. Because this is Golden Week when the entire country goes on vacation. This article was originally published on May 2, 2016. It has since been updated. Golden Week, or “GW” as it’s often abbreviated, is a series of holidays in late April and early May. They were officially established as national holidays in the late 1940s, but have changed slightly over the decades. What makes Golden Week in Japan unique is that they are a series of paid days off clumped together. Even if working days appear between the holidays, which they do, people go ahead and take the whole week off, especially if they have small children and want to travel or just need the time off. There’s a catch, though, for people making video games. But why’s it called “Golden Week”? The story goes that film Jiyu Gakko, released on May 6, 1951, did so well that an exec at Daiei Studios dubbed the national holidays “Golden Week,” a reference to “Golden Time,” or “Prime Time,” a term used in radio and now in television for the time blocks with the most viewers. Sunday, April 29 - Showa Day: This holiday marks the birthday of the Emperor Showa, whose reign lasted from 1926 to 1989. Previously, the date was called Greenery Date until 2006. FYI, the current Emperor’s birthday, December 23, is also a national holiday. Since it falls on a Sunday, this year, it is observed this year on Monday. Thursday, May 3 - Constitution Day: On May 3, 1947, Japan’s new postwar constitution went into effect. Friday, May 4 - Greenery Day: Previously, this holiday didn’t have a name. It was simply a day off, but after 2006, Greenery Day was moved from Emperor Showa’s birthday, giving this holiday a name. On Greenery Day, Japanese people are supposed to appreciate nature. People are probably more inclined just to appreciate the day off, nature or not. Saturday, May 5 - Children’s Day: While this day is for all children, the day is also known “Tango no Sekku,” or “Boys’ Day.” The day has been celebrated for centuries. Parents who have sons display miniature samurai armor (below, you can see the set that’s on display in my house) and fly carp banners so their sons grow up healthy and strong. Girls have their own festival in March when families with daughters display traditional Japanese dolls. These days, families celebrate the day with sons and daughters, eating rice cakes and celebrating their children. On the days that aren’t national holidays, some people still have to work and kids are still in school. Meaning that on Tuesday and Wednesday of this year, it’s business as usual for them. So unless you like dealing with crowds, stay away from Japan. That is, unless you want to experience Golden Week yourself, then, by all means, WELCOME. 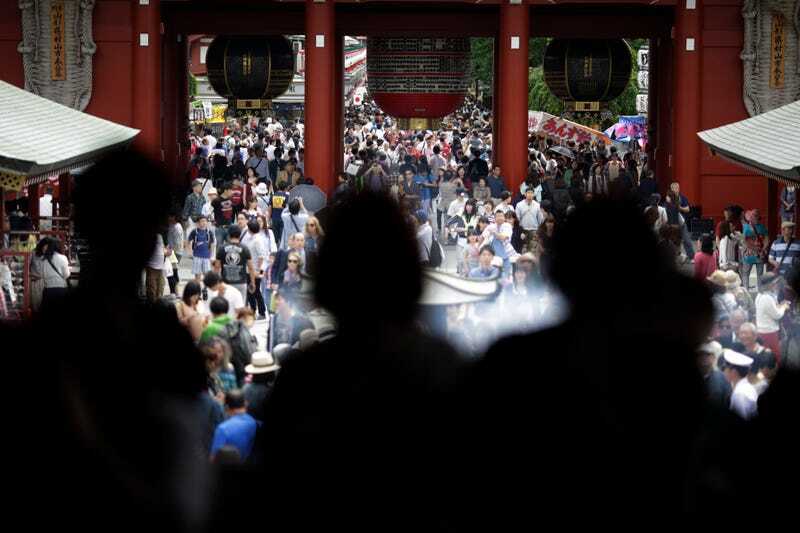 Everyone in Japan knows Golden Week is crowded, so people tend to handle the crowds well (or, at least, have mentally prepared themselves to deal with them). So, there is a “we’re all in this together” kind of attitude that enables people to enjoy themselves even while dealing with GW craziness. Since many Japanese people don’t get chunks of time off, save for New Year’s and Silver Week (another string of holidays in the fall), many people want to do something. That’s why hotels are booked early, often months in advance, and room rates shoot up. In short, Golden Week is spring break for the entire nation of Japan. There are exceptions, especially people in the service and tourism industry. But, generally speaking, this is one of the few blocks of vacation time that companies must grant their employees because they are national holidays. Certain days during Golden Week are truly awful. The worst days are often April 29, when everybody decides to travel, and May 5 to May 8, when everybody decides to return home. For example, according to NHK, on April 29 last year the occupancy for unreserved Nozomi bullet train tickets leaving at 6 am from Tokyo for Western Japan shot up 200 percent. Basically, the bullet train is incredibly crowded. If you don’t have a reservation and even if you can get an unreserved seat, the trains are so crowded, you might end up standing the entire trip, which is no fun. Airports are also packed. According to TV Asahi, on April 29 of last year, a total of 77,000 people flew internationally out of Narita and Haneda Airports, both of which serve greater Tokyo. These folks are actually leaving the country to, perhaps, deal with crowds that are more manageable than the ones in Japan. The numbers for those simply travelling from Narita Airport, domestic and international, are staggering. The roads are also jammed with traffic, turning busy sections of the highway into parking lots. The between days during Golden Week are “less bad,” but that’s relative. This is still peak travel season for people in Japan. Then, the other issue is that even if you are not travelling by bullet train, highway, or airplane, tourist spots within the country are swamped. During Golden Week, do not go to places like Tokyo Disneyland, Universal Studios, zoos, movie theaters, or pretty much any place children want to go. Those tend to draw the worst crowds. Ditto for big shopping areas. Anyplace that is crowded on a weekend in Japan will be infinitely more crowded during Golden Week. But, let’s say you end up in Japan during Golden Week. Can you still have fun? Sure. Just realize that most places you go are going to be more packed than usual. All is not lost! Website Tokyo Cheapo has good advice, suggesting visiting the areas surrounding the cities (i.e. the suburbs, because everyone there has gone elsewhere), or travel after and before the peak travel days. You can find places that are not crowded, but you must be smart. Basically, think about where people are heading and then go in the opposite direction. Considering the crowds and the higher prices, the best advice, though, might be to pick another time to visit Japan. The week after, for example. For more on Golden Week, check out these helpful articles on Tofugu, Zooming Japan, and Tokyo Cheapo.